Visit AARP.org/RogueValleyHouse to take a tour inside this 'Level 2' certified home. 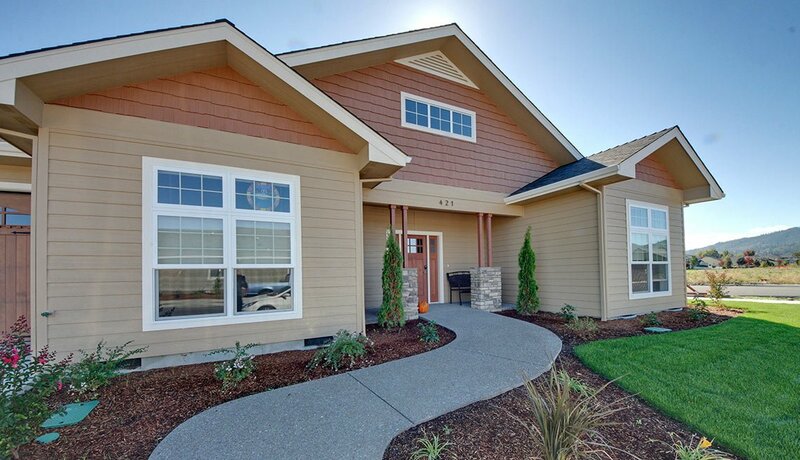 Recognizing that the Rogue Valley region of southern Oregon doesn't have anywhere near enouigh accessible and aging-friendly housing, the Rogue Valley Council of Governments — a regional body representing 22 municipalities — established the Lifelong Housing Certification Project. The age 65-plus population in Oregon is expected to increase 105 percent by 2050 and the 85-plus population by 214 percent. This is especially true of the two most populous counties that make up Rogue Valley, where 40 percent of the residents in Jackson County and 46 percent of those in Josephine County are already 50 or older. A voluntary evaluation program, the Lifelong Housing Certification Program provides a way to assess the "age-friendliness" and accessibility of both newly constructed and existing homes. Developed by the RVCOG in collaboration with AARP Oregon, the program includes a comprehensive checklist of features and defines levels of certification based on various universal design standards. The certification is appropriate for all homes — rental apartments, new construction or existing houses — and is intended to help consumers and industry professionals choose the desired level of accessibility in buying, selling or modifying homes. The Lifelong Housing Certification Program helps the marketplace respond to a growing demand for accessible and adaptable homes that promote aging in place safely and independently. At the same time, the certification makes it easier for individuals of all ages to find homes that are suitable for lifelong living and promote the social and economic value of lifelong livability. The home contains the mandatory features that are needed for visitability by all guests. For example, a person using a wheelchair must be able to easily navigate the main living area, a bathroom and the access leading to and from that bathroom. HISTORY: Discussions and program planning began in 2010. The certification program pilot testing of the standards began in 2011. In 2012, RVCOG and AARP convened a statewide committee to refine the standards and facilitate expansion of the program into other parts of the state. The program became available for public use in 2013, and the first certifications were issued in 2014. THE STAKEHOLDERS: The program's local and statewide committees include participation from AARP, RVCOG and other aging and disability agencies; housing industry professionals, including builders, Realtors, home inspectors, architects, Certified Aging-in-Place Specialists (CAPS); members of local home builders and real estate associations, independent living centers, and local nonprofits; aging advocates and consumers with disabilities. THE TARGET AUDIENCE: The program seeks to engage professional builders, remodelers, contractors, Realtors, landlords and consumers who are home owners, home sellers, home renters and caregivers for older adults and family members with disabilities. SPREADING THE WORD: Local consumers and housing industry professionals learn about the program from outreach activities (such as a booth at the Southern Oregon Home and Garden Show) and educational events for consumers and industry professionals that are organized by RVCOG, AARP and other partners, including the local organization Age-Friendly Innovators. People can also find or learn more about the program online at the Rogue Valley Council of Governments website rvcog.org. The home is fully accessible and includes a variety of mandatory and optional features that make the home’s central living area suitable for lifelong living; it also ensures that a person using a mobility device can perform all personal and housekeeping functions. After the evaluation, the inspector provides the completed Lifelong Housing checklist and the certification fee to RVCOG. RVCOG issues a certificate to the homeowner and adds the home to its database. The homeowner or builder provides a copy of the certificate and checklist to potential buyers. The certification may also be indicated on the local Multiple Listing Service in order to flag the home as being a "lifelong home" and alert potential buyers to ask the home seller or real estate agent for information regarding the home’s certification level. The RVOGC Senior and Disability Services, in partnership with AARP Oregon, convened a small working committee of industry professionals and consumers to develop a program to certify accessible housing. The goal was to raise awareness in the community about the value of accessibility in private homes in order to eventually increase the amount of accessible housing available in Jackson and Josephine counties. For 18 months the Lifelong Housing Certification workgroup met once a month to develop the standards checklist and accessibility levels, design an administrative process to implement the program, establish an inspection and certification process, determine costs and fees, recruit and train inspectors and set up procedures for database maintenance. The workgroup also developed and implemented a public education and promotion plan for the program. These homes have enhanced accessibility, which means that in addition to the requirements noted in the previous levels, the property has been further customized for personalized accessibility. The specific enhancements are listed on the certificate and could include smart technologies or features that meet the needs of people with visual or hearing impairments. The program is administered by RVCOG, which staffs the advisory council and maintains the referral database of certified inspectors and a list of certified homes. The inspectors are independent contractors or business owners (i.e., they are not employed by the RVCOG) who must be state-licensed home or building inspectors. They are required to attend an orientation about universal design and the specifics of the Lifelong Housing Certification Program in order to be on the referral list. The inspection fee for the certification is arranged between the Lifelong Housing Certification inspector and the homeowner since there will be variables that affect the cost, such as the location of the home and whether it is newly constructed or a remodel. Homes may require more than one visit. As noted, the standard recommended inspection fee is $150. An additional fee of $35 per certificate is paid to RVCOG for program administration. The response to date has been positive from all sectors, and was especially so during an April 2014 industry symposium where participants included Realtors, contractors, builders and inspectors who understand the demographic realities of today’s housing consumers and recognize the market value of adopting age-friendly approaches. Age-Friendly Innovators, a local nonprofit, has been championing the program and has worked with builder W.L. Moore Construction on the construction of five LLH certified homes in Twin Creeks, a transit-oriented development located in the Jackson County city of Central Point. The five homes were sold in record time. The program has also had a great response from the general public. Consumers are using the certification checklist as a guide when considering home modifications. Remodeled homes have started to be certified. In the summer of 2014, RVCOG received an Innovations Fund Award from the Oregon Department of Human Services to further develop the program and reach more industry leaders. The award also includes a pilot to demonstrate whether home modification for accessibility can save public dollars for long-term services and supports. Bandana Shrestha is the AARP Oregon associate state director for community outreach. Take a look inside this Rogue Valley Lifelong Housing certified home.